Arizona is a state located in the American Southwest. It is bordered by Utah to the north, New Mexico to the east, Mexico to the south, Nevada and California to the west. Arizona is also one of the Four Corners states, at which point it touches the southwestern corner of Colorado. 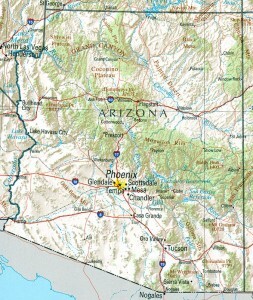 Arizona is the sixth largest state in the United States, with an area of 113,998 square miles (295,253 km2). Phoenix is the state’s capital. Other important cities in the state include Scottsdale, Surprise, Peoria, Glendale, Chandler, Tempe, Tucson, and Flagstaff. Arizona is divided into fifteen counties: Apache, Cochise, Coconino, Gila, Graham, Greenlee, La Paz, Maricopa, Mohave, Navajo, Pima, Pinal, Santa Cruz, Yavapai, and Yuma. The geographic center of Arizona is located in Yavapai County, 55 miles (89 km) east-southeast of Prescott. The majority of Arizona’s residents live in Maricopa County, which ranks fourth among the nation’s counties in terms of population. In fact, Maricopa County is more populated than 24 whole states! The county seat of Maricopa County is Phoenix, which is Arizona’s largest city and capital. The next most populous county is Pima County. 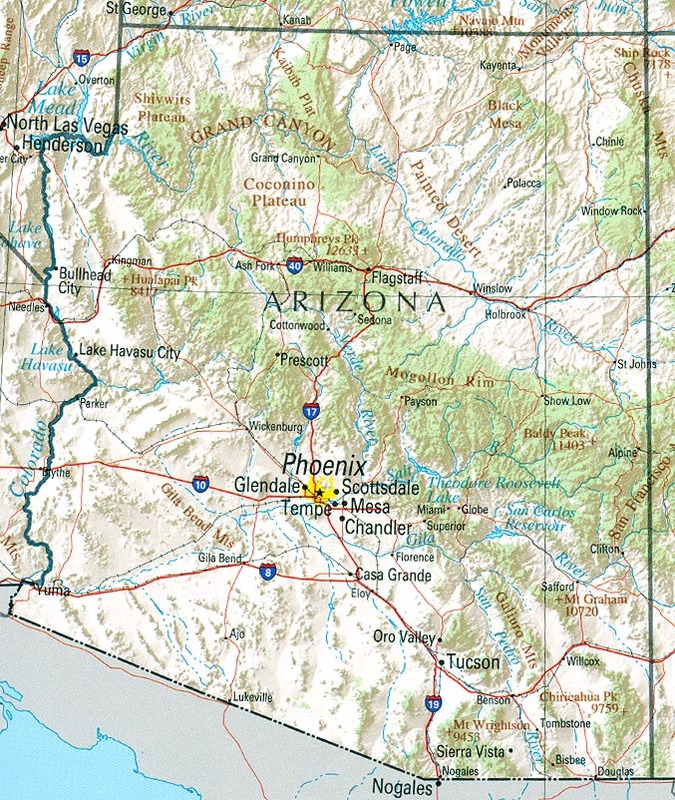 The county seat of Pima County is Tucson, where nearly all of the population is concentrated. Combined, nearly 80% of Arizona residents live in either Maricopa County or Pima County, even though the two counties make up only 16% of Arizona’s total area. Over half of the state’s land is government-owned (in the form of national parks, national forests, wilderness areas, national monuments, recreation areas, and military installations), and approximately one-fourth of the state’s land is held in Indian reservations. Arizona is home to 21 federally recognized tribes, which are each semi-autonomous. The large majority are part of the Navajo Nation, which is the largest American Indian reservation in terms of population and size. The Navajo Reservation covers all of northeastern Arizona along with portions of New Mexico and Utah. For a long time, Arizona earned most of its money from the four C’s – cotton, cattle, copper, and climate. Today, manufacturing (i.e. electronics, aerospace, metal fabrication) is the leading industry, while tourism is also very important. The warm, sunny weather together with a wide variety of natural wonders attracts large numbers of visitors. Arizona’s beautiful landscape includes mountains, valleys, plateaus, canyons, and deserts. Due to the state’s large area and range of elevation, there is a variety of localized climate conditions. Overall, most of Arizona receives little precipitation, and is classified as having either an arid or semi-arid climate. The northern parts of the state and the mountainous areas tend to have cooler climates, while the southern parts of the state tend to be warm year round. Some of the many interesting sites there are to see in Arizona include: the Grand Canyon, Petrified Forest, Painted Desert, Hoover Dam, Meteor Crater, Ponderosa pine forests, giant saguaro cacti, extinct volcanoes, ancient cliff dwellings, old Spanish missions, ghost towns, copper mines, and astronomical observatories. We should be able to skate on the pond, assuming it freezes relatively flat (i;1#82&7ts pretty bumpy right now, as it freezes and thaws) and we can be bothered to shovel it off!